Enterprise fallout continues . . .
On Wednesday I posted about how, through a combination of a corporate rule change and a zealous clerk, Enterprise Rent-a-car managed to keep my wife and I from attending the “life celebration” of my wife’s cousin. What I didn’t tell you at the time was that the very next day was my 18th wedding anniversary with my wife. Because of the extreme pain that I was in from the walk home, I was able to do nothing with my wife to celebrate the day – except aggravate one of my greatest ongoing concerns. Let me back up the story. Back when I was 16 years old, my parents split up, and as the oldest child of the family (someone at constant odds with both parents) I took their split very hard. In fact, at the time, I took it as my own personal responsibility even though there was nothing I could do to undo it. Choosing to move in with my father, and the woman who eventually became my step-mother, I found that I had a ready access to alcohol. Of course, I also knew that they monitored the liquor supply in the house – what responsible parent wouldn’t? But with an IQ of 149, I’m nothing if not an efficient problem solver. So, at 16 I started drinking hard liquor. Gin, whiskey, tequila, even Everclear. I just consumed it in small quantities so the adjustments werren’t quickly noticed. Eventually, I was caught. No plan devised by a 16 y/o is fool-proof. But, by then I had built up enough of a tolerance to liquor that I could consume quite a lot without losing all control. My dad was concerned that I was an alcoholic, and on an intellectual level I had to grant that while I still felt I had control, it could be possible that the alcohol was deceiving me. So, I quit, cold-turkey to assert my dominance over the possibility of dependence. But, at the age of 17.5, I graduated from high school and reported to active duty in the US Army – where the accepted and normal way to spend off-duty time was in the copious consumption of alcohol. Once again, the ugly specter of alcoholism reared it’s ugly head. Mind you – I have never joined any sort of support group, nor have I every cried uncle when challenged by this foe, but my real point here is that this has been a demon I’ve kept a watchful eye on ever since. I never quit drinking. I also never allowed alcohol to wrest control from me. But at times, it has felt like a high-wire act to keep a balance between the ability to consume versus the effects of the consumption. Never has that been more obvious to me than yesterday – when I wanted to be sober enough to enjoy our anniversary with my wife, but literally needed all of the pain relief I could get. All because of what happened in my interaction with Enterprise Rent-a-car the day before. We (my wife and I) ended up spending the day watching a marathon of season 1 of the Supergirl CW TV series, with her adding a shot of whiskey to every cup of my coffee. But it upsets me that I was, once again, put in a position of feeling like I had to be mindful of that . My wife and I have known for some time that our car is not something to use on long trips, so while we’ve been saving money towards buying a newer car, we’ve been using Enterprise Rent-a-car whenever we needed to travel. In fact, we’ve been a customer of Enterprise longer than we’ve had our current car – going on 10 years, now. But never again. In 10 years, we’ve never turned in a car late, had an accident, or failed to pay in full. We’ve also never had bad service (except once when I went through the 800-number call center to make a reservation, and they messed it up so the local office didn’t get notified and didn’t have a car when we needed it), so we were happy to continue giving them our business while we saved towards the newer car we hoped to get. That all ended this morning. Last week, we learned that one of my wife’s cousins – a woman the same age as my wife – had died of cancer. She was cremated, and the family was having a “life celebration” this afternoon. I made a reservation – last week – for a car we’d pick up this morning. When I arrived at our local Enterprise Rent-a-car office, they had a car ready for us, and just a little paperwork to do. It was all very routine – until the clerk doing the paperwork asked me for a 2nd phone number. I told him that I don’t have a second phone number. He pressed me for a cell, or a work number. I told him that I’m disabled and unemployable, so I don’t have a work phone, and since I rarely leave the house I don’t need a cell phone. My landline is all that I need. He kept pressing. I even told him that he had the same information that has been in there for the last 10 years, and nobody had ever refused to rent to us before. He said that the company had asked him to get 2nd phone numbers. I said “asked” does not mean “requires” – he said, “yes, it does.” This went on for over 5 minutes. Finally, I said that if he wouldn’t rent to me with the information he already had, he would loose a sale. He apologized, but stuck to his guns that he wouldn’t complete the contract without the 2nd phone number. I then told him that he’d talked himself out of a sure sale, and that when I had to explain to my wife why she wouldn’t get to go say a final farewell to her cousin, it was a certainty Enterprise Rent-a-car would never get our business again. Then, to add injury to insult, they wouldn’t give me a ride home. It’s over 1.5 miles from there to our house, and my daily TOTAL walking limit is “no walking more than a mile”. I’m in a LOT of pain right now, because their corporate office decided not to rent to someone who chooses not to be part of the whole “Totally connected and wired in” generations. 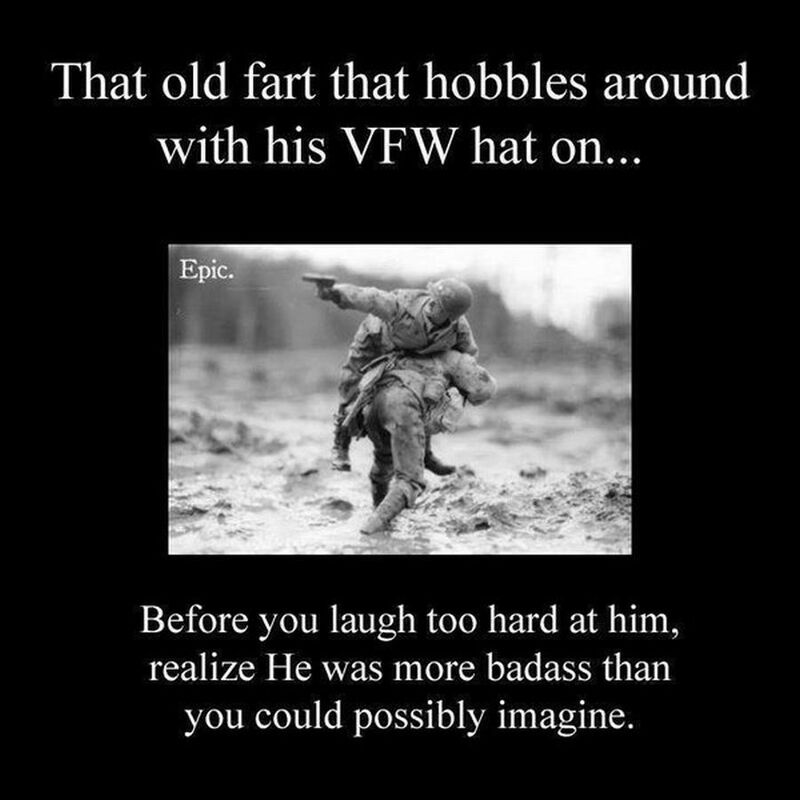 Veterans are badass . . .
Keep one other thing in mind – – – whatever war movie (or video game) you like? He may have lived it. The last time I wrote about my struggle with Social Security over whether or not I qualify for disability, they had to reschedule a hearing because the doctor who was supposed to give expert testimony after a review of my records had not received the disc the records would be on. Well, we finally had the replacement hearing on Tuesday morning. Normally, I would have posted about it by Wednesday, but the whole “May the 4th be with you” thing caused me to delay writing the post. Intuitively, I knew I needed to wait. Thursday afternoon my lawyer called us. Since my wife is taking vacation time, she was the one who answered the phone. First, let me share some of my initial observations about the hearing on Tuesday. The court clerk/typist who usually works in the office I sit in was visible on the video feed sitting in the office with the judge. She had been replaced locally with a woman who had a less-than-professional bearing. For one thing, knowing how to touch-type myself, I observed that she (the replacement) was going to have trouble accurately typing anything with finger nails that extended 2″ beyond the end of her fingers. Anyhow, we had the hearing, and the judge seemed pleased with how smoothly and quickly it went. My lawyer was nearly ecstatic over how easily she got me to give the specific answer that she needed when she asked me certain questions about my history. So, when she called me on Thursday afternoon, I was almost thinking that she’d been told we finally won. Still, intuition said the party was premature. It was right. My lawyer had just spoken with the judge, who could not apologize profusely enough for what he had to tell her. In nearly 20 years of work as a lawyer, she’s never experienced anything like this before. There exists no record of the hearing Tuesday. We had a video conference call with the Judge in his court room, but not one minute of it was recorded. The typed transcript was not “suitable”. Yes, it did. They are scrambling to reschedule ALL of them for as soon as possible – probably at least 3 months, could be as long as 6. Stay tuned, we’ll be back after this commercial break. Another Social Security hearing . . . Yesterday afternoon, I had another hearing with the Social Security people about the status of my claim for disability benefits. Some good things resulted – my lawyer reviewed my records again (several times, actually) and has realized that one of the potential weaknesses of my case can be completely explained BY SOMETHING IN THE RECORDS in a way that negates the weakness entirely. I suppose that is rather vague, and it doesn’t need to be, so I’ll elaborate. I’ve made no secret on here of the fact that I used to be a staff member of a Church of Scientology – I was an ordained minister and conducted Sunday Services for several years. Yes, I’ve left the church – but because I had problems with the church, not the collective “scriptures.” I still have my entire collection of materials that I built up while I was on staff. I believe that the tech works well, when it is used correctly, and I believe that the church has been deliberately misusing it for years. My VA medical records reflect that I had my religious preference listed as Scientology, and that is where things start getting interesting for the Social Security case. One potential weakness to my claim has been that the judge reviewing my medical records has been seeing notes in those records that I’ve been “non cooperative” with medical professionals when they tried to give me certain drugs to treat my migraine headaches. If the doctor tells me he wants me to try something (let’s say, for example, PROZAC) that I know is usually prescribed for psychiatric cases or has potential hallucinogenic effects, I’ll tell the doctor straight up that I won’t take it. That is documented in my medical records. The reason WHY I won’t take it is because I still believe in the Scientology principles, even if I don’t support the church. Remember a few years ago when Brooke Shields went public with taking psych drugs to treat postpartum depression? Tom Cruise made a big splash in the media for attacking her over the admission. I agree with Tom that taking the drugs is a mistake; I disagree with placing public judgement on another for the choices they make regarding them, especially when they don’t share my beliefs. Anyway, my lawyer feels that whether or not I succeed in my claim for disability looks like it’s coming down to that one issue – the non-compliance with medical advice. She’s going to raise the issue of religious belief at the next hearing if the questioning goes that direction. I say “at the next hearing” because yesterday’s hearing was almost literally a non-starter. It lasted 5 minutes. The major reason for the hearing was to get the testimony of a medical professional who is being paid to review my treatment records and determine if I am functionally unable to hold a job. After we convened the hearing and officially went “on the record” – meaning that everything said from that point forward would actually become part of the case records – the judge asked the court secretary to call the doctor (who was scheduled to give his testimony live over the phone). When she got him on the line, the first thing he said was that he called the judge’s office yesterday and told someone that he never received the disc with my records. The judge immediately realized that the doctor couldn’t testify about records he hadn’t reviewed, adjourned the hearing, and made a note that we’d (my lawyer and I) get a notice when the hearing is rescheduled. VA hospitals . . .
Ok, you know I’m a veteran, and that I’m disabled. I’ve been disabled since I had a bone tumor operated on by the US Army in October of 1980. Up until about 5 years ago, I kept working, doing whatever I could. I reinvented myself over a dozen times to learn a new trade that was within the range of physical ability I was experiencing. Last year, I finally threw in the towel and applied for Social Security disability (because the VA benefits I get with a service-connected disability are just about enough to go out to eat twice a month). However, as a veteran who hasn’t had private health coverage, the vast majority of my health care records are held at VA hospitals. Guess what? Yesterday when I got to an administrative hearing on my SS case, I found out that the VA had just flat-out not complied with written requests for records from my lawyer & Social Security. Sadly, that isn’t even unusual. The lawyer and judge both stated – ON THE RECORD – that they were aware of VA’s reputation for not providing records to the courts or Social Security. The absolutely worst VA center between the Rockies and the Appalachian Mountains? St. Louis – where my migraines were diagnosed and initially treated. None of those records were available to corroborate my claim. Not even the information to verify the date of when I first started getting migraines. Seriously – you do NOT want Obamacare to work. You don’t. Because if it does, the health care I get now is the health care you’re going to live with the rest of your lives. And you children, their children . . . .